When you decide that you are going to get started in golf, one thing is clear right away – you are going to need some clubs. You can’t get started in the game without a set of clubs, so this should be your first task once you decide that golf is the right hobby for you. The good news is that you don’t have to spend a fortune to buy your first set. Sure, there are plenty of expensive sets of clubs on the market, but you can save those for the more experienced players. When just getting started, look for an affordable set that offers the performance characteristics you need to make your experience a good one. 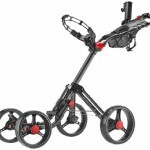 This guide on the best golf clubs for beginners should give you the information you need to make an informed purchase. So what are those performance characteristics that you should have your eye on? First, you want to look for clubs that are going to be forgiving at impact. Beginning golfers typically don’t have their swings finely tuned just yet, meaning they often struggle to hit the center of the club fact at impact. Pick out a set with oversized heads – both in the woods and the irons – to give yourself the best chance at success. Also, you will likely want to find a set with graphite shafts, as those will be a bit easier to hit than their steel counterparts. Another nice option to look for as a beginning golfer is a complete set that comes with just about everything you need to play your first round. More experienced golfers tend to buy their gear piece by piece, but you can take an all-in-one approach at this point in your golf timeline. Some beginner sets will include all of the woods and irons you need, along with a putter, a bag, and more. As a beginner golfer, if you’re looking for a good putter to get started I suggest checking out a mallet putter. Mallet putters are nice for beginners since they have a larger head which allows for an alignment aid Also because of how mallet putters are weighted, they allow for a more logical swing path for a beginner (at least in my personal opinion). 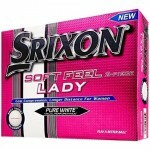 If you are looking for golf balls as a beginner, check out this guide on the best golf balls for beginners that I put together. If you would like to review some of the best golf clubs for beginners on the market today, please continue on to the content below. This first option on our list provides you with most of what you will need to get started in golf. Offered up by one of the best names in the golf business – Callaway – you will receive 13 total pieces when you order this beginner set. Included in the set is a driver, 3-wood, hybrid club, set of irons, a putter, and a stand bag. While there will be a few other things for you to pick up (such as shoes and balls) before you make your first tee time, this set will take you most of the way toward being ready for the first tee. As you would expect, the clubs in this set have been designed with the beginner in mind. That means that the irons are perimeter weighted to promote forgiveness, and the woods have graphite shafts to help you develop as much swing speed as possible. It is also an advantage to have the set include a stand bag, as you can use this kind of bag either while walking or riding. The stand will be a huge advantage when you need to set your clubs down to hit a shot, as you don’t want to lay your entire bag down on the ground every time. Of course, this kind of bag will work just fine when you choose to ride, so either option is in play when you pick this beginner set. These clubs are perfect for beginners or people getting back into golf. Therefore, these clubs are not made with the highest quality. They are a bargain set. If you use them heavily, you will have some small dents. One thing that is missing is a higher lofted wedge. This might be an issue if you are a beginner and are struggling to get the ball off the ground. Sometimes a sand wedge or lob wedge is perfect for that. If you are a true beginner who is looking for your first pieces of golf equipment in order to try your hand at this difficult but addictive game, the Wilson Ultra set is a strong contender for your business. This set includes standard length clubs, head covers for the woods and hybrid, a putter, a bag, and more. Additionally, this set even comes with a package of 15 golf balls, so you will have plenty of replacements available if you happen to lose a couple along the way. This is a great set when you are trying to find your way on the course early in your golf ‘career’. This is a game that can be a big intimidating at first, but this set will provide you with most everything you need to start to learn the game from the ground up. You aren’t going to be an expert after just a round or two, but you will likely be addicted to the process of getting better and better as you go. Wilson is a brand name that has a long history at all levels of the game, from supplying beginners up to the best players in the world. Before you place an order for a beginner set, be sure to at least consider this solid option. This set is a great beginner bargain set. It includes good club diversity and the clubs are made to accommodate a wide range of swing speeds. If you do not play often, but want a cheap set of clubs that has all the tools, but you are not on the hook for a major purchase, this is a great option for you. The bag comes with many extra pockets which is nice for balls, tees, rain gear, etc. the bottom line is this set is made for a low budget, and for casual rounds. The clubs themselves are durable for their price, but should not be worked too often. 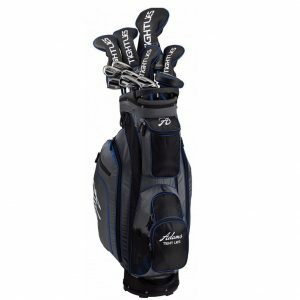 Continuing with the theme of clubs coming from top brand names, this set from Adams also includes everything you need to get started. The Adams ‘Tight Lies’ line has long been a staple in the golf world, and beginner golfers will get plenty of quality and performance when they go for this option. While this set is more expensive than the others on our list, it has the quality to back up that price. 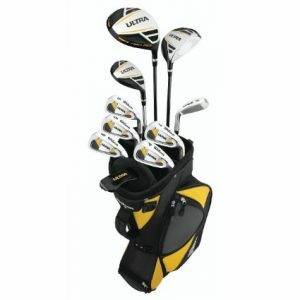 This set includes a driver, fairway woods, hybrids, a set of irons, a sand wedge, a putter, and a bag. There are two options for shaft flex, and the shafts are graphite to enable you to develop as much power in your swing as possible. Starting with the driver, which has a 460cc head, this set is easy to hit from top to bottom. You don’t want to be fighting your equipment when you are just getting started in this game, so this set from Adams will always be working with you, not against you. If you are serious about getting started on the right foot in golf, and you don’t mind investing some money to do so, the Adams Tight Lies set is one to carefully consider. 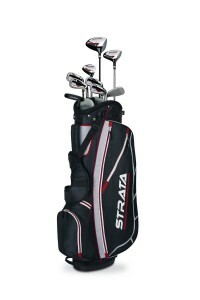 This is a full set of beginner clubs, and includes a golf bag. The clubs are slightly bigger in size than normal beginner sets and more forgiving. If you are a little bigger than the normal beginner, this may be a good option for you. You can expect more weight in these clubs than other starter sets, and the clubs will be much more durable than other bargain sets. Is this worth that extra cost? It will depend on how much more you need than the true starter sets that usually range around $250. Any of the three sets of clubs in the list above would make for a great choice as you seek to get started in golf. Remember, you don’t have to break the bank right away when buying golf equipment, as there will be plenty of time later to upgrade as your skills improve. Also, since you have to pay for other things like greens fees, range balls, shoes, balls, gloves, and more, you don’t want to blow your whole golf budget on your set of clubs. Have fun shopping and good luck with your first round!